Margaux Resources (V.MRL) is a mineral acquisition and exploration company focused on zinc, gold and tungsten resources in the richly mineralized Kootenay Arc region of southeastern British Columbia. The company is directed by a group of highly successful Canadian business executives and has a fast-growing portfolio of past-producing properties with excellent upside exploration potential. On the basis of historic production, the company’s Jersey-Emerald property is the 3rd largest zinc-lead producer in British Columbia, as well as the second largest tungsten producer in North America. Margaux’s nearby Sheep Creek property has historic gold production totaling 690,000 ounces, from 26 historic gold vein mines and is analogous to the Barkerville District of central British Columbia. Margaux Resources Ltd. (TSXV: MRL) (OTCQB:MARFF) (“Margaux” or the “Company”) is pleased to provide highlights of its 2017 exploration activities on its southern British Columbia (“BC”) Sheep Creek Gold District and Kootenay Arc Zinc District. A new video which summarizes the 2017 work program is available at the following link, (https://youtu.be/Qg2gZF8Z2LE), and is posted on the Company’s website, www.margauxresources.com. Funding is in place for Margaux’s 2018 exploration program, which will focus primarily on the Sheep Creek Gold District. Numerous high priority drill targets have been identified and are permitted for drilling; greater detail of the 2018 drill program will be announced in a subsequent news release. The Sheep Creek Gold District and Kootenay Arc Zinc District are adjoining projects which together cover over 24,000 hectares of mineral tenure. For the first time ever, Margaux has consolidated the mineral claims in this area under one ownership, to allow for thorough and systematic exploration. During 2017, Margaux drilled 34 holes (6,552 m) on the Company’s claims; final analytical results have now been received for all drill holes, highlights are included in the summary tables below. A recent Geoscience BC1 study showed that orogenic gold mineralization at the Sheep Creek Gold District is analogous to that in the more widely known Barkerville area. Orogenic gold accounts for almost half of BC’s gold production, with Margaux’s Sheep Creek Gold District ranking as the 3rd largest past-producing orogenic gold district in BC (after Barkerville and Bralorne). Historic gold production from the Sheep Creek Gold District is 785,000 oz gold, at an average grade of 14.4 g/t gold (0.42 oz/t gold). Unlike Barkerville and Bralorne, the Sheep Creek Gold District has had little exploration since mining ceased in the early 1950’s. Margaux acquired the Sheep Creek Gold District in 2017, through several option agreements and through in-fill staking, to assemble claims covering a 10 km mineralized trend. Historic data was compiled and digitized, a prospecting and rock sampling program was undertaken to locate and assess historic showings, a LiDAR survey was completed and multi-year area-based drill permits were applied for, and received, for 3 separate areas within the district. The Company commissioned an independent NI 43-101 report and undertook a 19 hole (4,039 m) drill program which concluded in mid-December 2017. The drilling was designed to test a variety of wide spaced, big-picture targets, as opposed to close-spaced definition-type drilling on a single vein. Targets tested in 2017 included: new veins with no previous drilling and no historic production (Maggie Aikens and Kat), the at-depth continuation of veins below the depth of historic mining (Bayonne and Bluestone), and conceptual blind-vein targets in brittle units, at depth in the core of anticlines. The program was highly successful: at least one promising new vein was discovered which requires further drilling; gold grades were confirmed from two previously undrilled targets; and two veins were also shown to continue to depth, with good gold grade, below the limit of historic mining (Bayonne Main and A vein). The Kootenay Arc is a regional geological belt that hosts numerous carbonate-hosted lead-zinc deposits. Margaux’s Kootenay Arc Zinc District covers a 30 km strike length of the Kootenay Arc in southern BC, including the past-producing Jersey-Emerald lead-zinc mine. In 2017, Margaux drilled 15 holes totaling 2,513 m in the Kootenay Arc Zinc District, this included 6 holes (1,115 m) on the Jersey property to explore for lead-zinc mineralization peripheral to the historic mine, and to test unrelated gold skarn mineralization located nearby. Margaux added the Jackpot property to its Kootenay Arc Zinc District in late 2016, by way of an option agreement. 2017 was the Company’s first year of work at this prospect. Historic data was compiled and digitized, a multi-year area-based drill permit was applied for and received, surface chip sampling was done and a LiDAR survey was flown. In late summer 2017, a 9 hole (1,397 m) drill program was completed on the Jackpot property. Highlights from 2017 drilling in the Kootenay Arc Zinc District are shown in Tables 2 and 3 below. Both high-grade mineralization, with potential for underground mining, and large tonnage, lower-grade mineralization that is potentially open-pittable, exist on Margaux’s Kootenay Arc Zinc District. Finally, Margaux wishes to announce that the Company will be attending the PDAC conference in Toronto, March 4-7 2018. We invite shareholders and other interested parties to visit us at Booth 2952. Results reported in this release are composite, weighted average grades returned from continuous drill core samples across the interval. For gold, all intervals returning > 3 g/t Au are reported. For zinc, all intervals returning >1.5 m grading >6% Zn or >25 m grading >1% Zn are reported. Results for Pb and Ag are included for these intervals if values exceed 0.1% or 1 g/t, respectively. Intervals reported are core intervals. Further drilling is required to understand the relationship between core interval and true width. After logging, intervals marked for sampling were sawn along the core length, with half of the core placed in bags for analysis and the remaining half core piece returned to the box for reference. Samples were shipped to ActLabs’ Kamloops, B.C. laboratory for preparation and analysis. Actlabs is an independent laboratory, recognized with expertise in analytical geochemistry and certified with ISO 9001:2008, ISO 17025, CAN-P-1579 certification. At the lab, samples were crushed so that 80% passes through a 10 mesh (2 mm) screen, then a 250 g split of the crushed sample was pulverized to 95% passing 105 microns. All samples were analyzed for gold by FA/AA finish on a 30 g sample of pulverized material, and for a multi-element suite by ICP-MS following aqua regia digestion of a 0.5 g sample. For samples returning >5000 ppm Zn or >5000 ppm Pb, samples were subsequently analyzed using peroxide fusion/ICP-MS techniques, while gold samples returning > 5 g/t Au by FA/AA were subsequently analysed by FA/GRA on a 30 g sample. Industry best-practice QA/QC procedures were implemented during the drilling program, including the insertion of analytical blanks and standards at regular intervals, as well as systematic duplicate sampling. Core size was NQ2 (50.6 mm = 2-inch core diameter). Margaux Resources Ltd. (TSXV: MRL) (OTCQB:MARFF) is a mineral acquisition and exploration Company focused on the development of gold, zinc and tungsten deposits in the Kootenay Arc, in the southeastern region of British Columbia. The Company is directed by a group of highly successful Canadian business executives and is focused on exploration of the Company’s Kootenay Arc Zinc District, and Sheep Creek Gold District. Gold, zinc, tungsten: Tyler Rice, CEO of Margaux Resources (V.MRL) has a true polymetallic property to explore. Located in South Eastern British Columbia, the Margaux properties follow the rich geology of the Kootenay Arc. On February 27, 2018 the company announced that it had completed two significant consolidations of lands, projects and mineral tenures in the area which means that Margaux controls both the Sheep Creek Gold District, “the third-largest, past-producing orogenic gold district in BC (after Barkerville and Bralorne)” and the Kootenay Arc Zinc District including the past-producing Jersey-Emerald lead-zinc mine. Margaux explored the sections of the Sheep Creek District it controlled in 2017 and in the February 27 release indicated that it would be releasing highlights of the results of that exploration “shortly”. It is waiting on the last of the results from its 2017 30 drill hole program. However, the fact the company has continued to acquire land through in-fill staking since the initial acquisitions and has worked to consolidate the highly fragmented district suggests the company liked what it was seeing as it explored. As zinc continues its strengthening in the international markets, having a past producing zinc District on the books is a terrific asset. Margaux explored the old Jersey-Emerald lead-zinc mine, which produced eight million tonnes of zinc ore prior to its closure nearly fifty years ago, and Margaux’s Jackpot property, where there has been no historical mining, but where Margaux’s 2017 drilling program identified numerous high-grade zinc intercepts, as well as near-surface lower grade zinc mineralization potentially suitable for open-pit mining. In the press release, Rice stated “Although zinc mineralization is known to exist in commercial grades in the Kootenay Arc Zinc District, Margaux’s exploration program is producing new data, and with it, valuable insight. This is about bigger data as a path to bigger rewards. We plan to assess the full extent of the resource base and mining alternatives.” Once again, the fact Margaux has gone ahead and in-filled staked and consolidated the claims in the area is a tell as to what the “big data” is showing the company. For most companies, two significant mineral deposits would be more than enough to occupy the geologists and the drillers. However, Margaux has another, near-term prospect in the form of a tungsten tailings recovery plan. It has sent a 3500 kilogram sample to the Cronimet Mining Group, a global industry leader with regards to tailings beneficiation and expects to have the results back from lab scale testing in the next few weeks. However, the results have been promising enough that Margaux has decided to proceed. The tailings pile this initial work is being done on is estimated to contain 1.4 million tons of tailings. 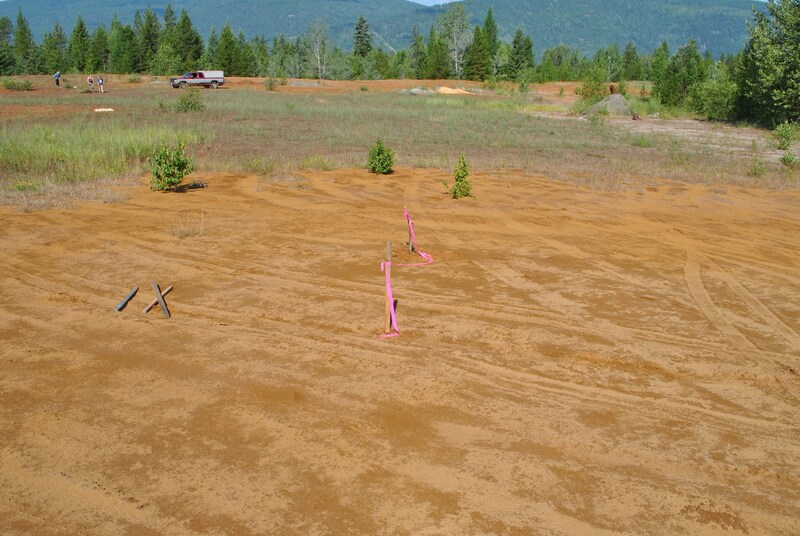 However, Rice points out that this pile is not the biggest tailings concentration in the area. Margaux is working with conservation and environmentalist group, StreamKeepers to identify other tailings targets. “There are more than 40 historical tailing deposits in the Salmo River basin, including 8 million tons of lead-zinc tailings we are aware of,” said Rice. Looking forward to 2018, Rice sees three milestones. First, he is looking forward to commencing its 2018 gold drilling program. Second, Rice wants to have the results of that program coming in Fall of 2018. And third Margaux is looking forward to gaining the bulk sampling permit, likely in Q2. The actual processing of the sample will begin shortly after receiving the permit. Margaux has the cash on hand to drill its 2018 program with 1/3 in hard dollars and 2/3 in flow-through dollars. Rice is also encouraged by the performance of the metals markets. “We have a diversified portfolio. Gold looks like it may make a move. Zinc is at a 10 year high. Tungsten is up since last summer,” said Rice. The Kootenay Arc was hugely prolific fifty years ago when miners chased single veins and the idea of 3D geological modeling was unknown. Bringing modern mining methods to bear should pay off for Margaux Resources. Margaux Resources Ltd. (TSXV: MRL) (OTCQB: MARFF) (“Margaux” or the “Company”) is pleased to report that it has completed two significant consolidations of lands, projects and mineral tenures, to establish the Margaux Sheep Creek Gold District, and the Margaux Kootenay Arc Zinc District (collectively the “Districts”). The Sheep Creek Gold District and Kootenay Arc Zinc District are adjoining Margaux projects, which together cover over 24,000 hectares of mineral tenure. For the first time ever, Margaux has consolidated the mineral claims in this area under one ownership. As a result, the Company will now have clear lines of sight over previously fragmented but highly prospective mineral tenures, and an improved opportunity to unlock their respective resource potentials using systematic exploration approaches and digital-age exploration technology. These Districts, in southeastern British Columbia (“BC”), Canada, each formerly consisting of highly fragmented and widely held parcels, mineral tenures, rights, options, access agreements and land positions, have been assembled by Margaux as contiguous Districts, under one ownership, for the purposes of mineral exploration and development. Margaux’s Sheep Creek Gold District is the third-largest, past-producing orogenic gold district in BC (after Barkerville and Bralorne). Historic gold production from the Sheep Creek Gold District was 785,000 oz gold at an average grade of 14.4 g/t gold (0.42 oz/t gold). Margaux holds lands, rights and options to the Company’s Sheep Creek Gold District, acquired in 2017, through several option agreements and through in-fill staking. Margaux has consolidated some 79 Crown grants and 33 formerly separate mineral claims covering a 10 km mineralized trend, which subsumes the majority of the historic Sheep Creek Gold Camp. 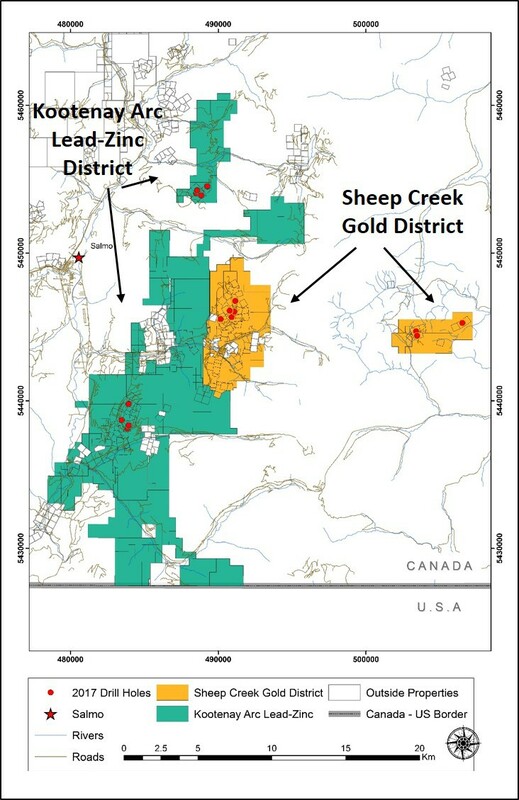 An independent report by Geoscience BC recently confirmed orogenic gold veining at the Sheep Creek Gold District as an analogue to BC’s gold producing Barkerville District. In contrast to the Barkerville and Bralorne, there has been little modern exploration at the Sheep Creek Gold District, which was last mined in the early half of the last century. Margaux expects to shortly report highlights of 2017 initial exploration of the Sheep Creek Gold District. Margaux’s Kootenay Arc Zinc District includes the past-producing Jersey-Emerald lead-zinc mine, which produced eight million tonnes of zinc ore prior to its closure nearly fifty years ago, and Margaux’s Jackpot property, where there has been no historical mining, but where Margaux’s 2017 drilling program identified numerous high-grade zinc intercepts, as well as near-surface lower grade zinc mineralization potentially suitable for open-pit mining. Margaux’s Kootenay Arc Zinc District straddles a 30 km strike length of the Kootenay Arc, a geological deformation which extends from BC into Northern Washington, which hosts lead-zinc deposits. 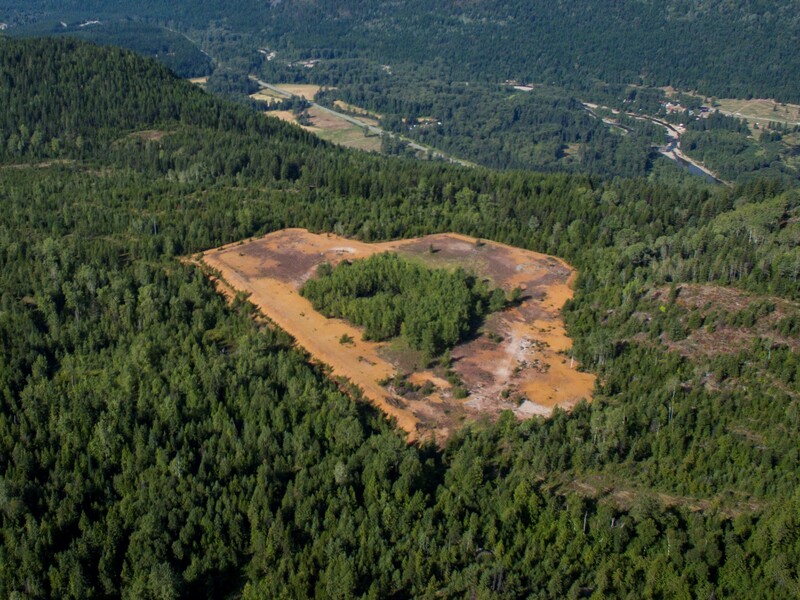 The Kootenay Arc features well-known, significant mine sites such as Teck’s active Pend Oreille Mine and Margaux’s historic Jersey-Emerald Mine. 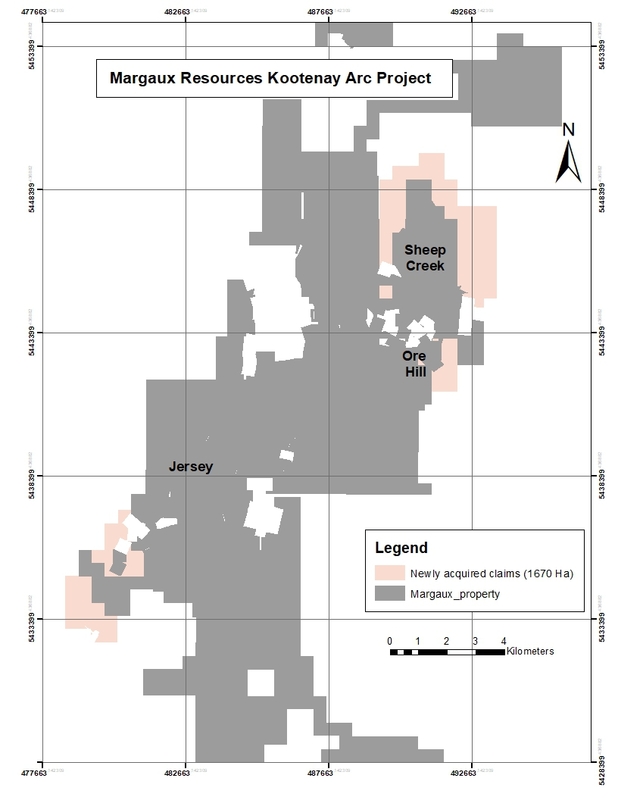 The Jersey Mine produced lead-zinc mineralization at combined grade of 5.58% Pb-Zn, from a nearly continuous zone of mineralization of 1,800 metres by 600 metres, ranging up to 30 metres thick. Margaux’s Kootenay Arc Zinc District has known lead-zinc resources: a NI 43-101 compliant lead-zinc resource exists for the Jersey property and Margaux is actively exploring for lead-zinc mineralization to expand this resource. The Company has completed an extensive program of surface and underground surveying, data entry and QA/QC work to verify historical drill and underground information. Preliminary work at the new Wilson Creek target is also encouraging. Wilson Creek is a 3 km x 1 km zinc soil anomaly within clastic sediments, with coincident aeromagnetic and EM anomalies, that is untested by any drilling. Where mineralization has been observed in outcrops, it is suggestive of stratabound, sedex-type mineralization. This is an entirely new deposit style for the Kootenay Arc Zinc District, within a rock type that is only minimally explored. The Company is also pleased to announce that it has entered into an agreement (the “Amending Agreement”) with Apex Resources Inc. (“Apex”) to amend the option agreement dated November 8, 2013 between Apex and Margaux, as amended on each of January 22, 2014, October 26, 2015, December 31, 2015, February 11, 2016 and March 30, 2016 (the “Option Agreement”), granting Margaux an option to purchase 100% of the Jersey Emerald Property for payments totaling approximately $4 million according to terms set forth therein. Pursuant to the Amending Agreement, option payments (the “Option Payments”) will be payable as follows: (i) $50,000 per month commencing April 1, 2017 for a period of 21 months for a total payment of $1,050,000; and (ii) $100,000 per month commencing January 1, 2019 until a total of $4.02 million has been paid to Apex under the Option Agreement. All other terms of the Option Agreement remain unchanged. Margaux Resources Ltd. (TSXV: MRL) (OTCQB: MARFF) is a mineral acquisition and exploration Company focused on the development of gold, zinc and tungsten deposits in the Kootenay Arc, in the southeastern region of British Columbia. The Company is directed by a group of highly successful Canadian business executives and is focused on exploration of the Company’s Kootenay Arc Zinc District, and Sheep Creek Gold District. Margaux Resources Ltd. (TSXV: MRL) (OTCQB: MARFF) (“Margaux” or the “Company”) is pleased to report that it has submitted a joint application to the British Columbia Ministry of Energy, Mines & Petroleum Resources, and the Ministry of Environment & Climate Change Strategy, for a Permit under the BC Mines Act to undertake a Bulk Sample of up to 10,000 tonnes of historic tailings from the historic Jersey-Emerald mine (“Bulk Sample”), in southeastern BC. The application is for a 10,000 tonne Bulk Sample of the brownfield historical tungsten tailings, to assess the viability of remediating the tailings site, and the potential to economically produce a marketable mineral concentrate from the entirety of the estimated 1.4 million tonne tailings deposit. The Bulk Sample will provide critical analysis of the recoverable minerals, the composition of the remaining bulk material, and the pathways to recycling and remediation. As previously announced, Margaux is working with the Salmo Watershed Streamkeepers Society (“Streamkeepers”), to explore sustainable economic and environmental solutions for historic tailings, with an initial focus on the tungsten tailings from the Jersey-Emerald mine (see the Company’s press release of August 18, 2017). This unique partnership is driven by a vision to be leading and responsible providers of successful, resource-based opportunities for all our stakeholders. The Bulk Sample project will also contribute to the process of gathering expertise, technological insights, and a pool of local resources to advance this, and future projects. “The Margaux-Streamkeepers partnership would like to showcase that it is possible to generate revenue from industrial activities, while also benefiting the environment, we have a unique opportunity to revisit what was once considered waste and revalue it in such a way that it will be removed from the pollution stream and otherwise contribute to expanded Stewardship efforts,” commented Gerry Nellestijn, Streamkeepers Coordinator. As a prerequisite to this application, Margaux and its technical partner, Cronimet Mining and Processing Inc. (“Cronimet”) (see the Company’s press release of September 12, 2017), have undertaken preliminary assessment of the technical and economic feasibility of recovering minerals/metals from the historic tailings, based on lab-scale testing of a 3,500 kg sampling of the tailings. This Bulk Sample project and the associated results will provide Margaux, Streamkeepers and Cronimet the necessary data to make a decision on whether to proceed with a project application for a full-scale tailings remediation and recycling project in respect to the historical tungsten tailings. Margaux is also pleased to announce the appointment of Mr. Don Nguyen as Chief Financial Officer of Margaux, effective February 1, 2018. Mr. Nguyen is a Chartered Professional Accountant and has been providing financial controller services to private and public companies in the junior mining exploration, healthcare, oil & gas and lodging industries. Most recently, Mr. Nguyen has worked extensively with Margaux’s senior management team and Board in his former role as Controller for the Company since 2015. Margaux Resources Ltd. (TSX.V: MRL, OTCQB: MARFF) is a mineral acquisition and exploration Company focused on the development of gold, zinc and tungsten deposits in the Kootenay Arc, in the southeastern region of British Columbia. The Company is directed by a group of highly successful Canadian business executives and has a fast-growing portfolio of previously producing properties that include the Jersey-Emerald mine, and the Sheep Creek Gold District. This press release may contain forward looking statements including those describing Margaux’s future plans and the expectations of management that a stated result or condition will occur. Any statement addressing future events or conditions necessarily involves inherent risk and uncertainty. Actual results can differ materially from those anticipated by management at the time of writing due to many factors, the majority of which are beyond the control of Margaux and its management. In particular, this news release contains forward-looking statements pertaining, directly or indirectly, to the following: Margaux’s exploration plans and work commitments, the receipt of required regulatory and other approvals, the potential of mineral resources and potential for recovery thereof, as well as other market conditions and economic factors, business and operations strategies. Readers are cautioned that the foregoing list of risk factors should not be construed as exhaustive. These statements speak only as of the date of this release or as of the date specified in the documents accompanying this release, as the case may be. The Company undertakes no obligation to publicly update or revise any forward-looking statements except as expressly required by applicable securities laws. Margaux Resources Ltd. (TSXV: MRL) (OTCQB: MARFF) (“Margaux” or the “Company”) announces it has been granted an extension of its previously-announced non-brokered private placement for aggregate gross proceeds of up to $3 million (the “Offering”) until December 22, 2017. Additional details regarding the Offering can be found in the Company’s news release dated November 2, 2017 and December 7, 2017. Subject to final TSX Venture Exchange approvals, the allocation of the Offering between the previously announced units and common shares (issued on a “CEE flow-through” basis pursuant to the Income Tax Act (Canada)) are subject to change, provided that the total proceeds of the Offering do not to exceed $3 million. Margaux Resources Ltd. (TSXV: MRL) (OTCQB: MARFF) is a mineral acquisition and exploration company focused on the development of zinc, gold and tungsten deposits in the Kootenay Arc, in the southeastern region of British Columbia. The Company is directed by a group of highly successful Canadian business executives and has a fast-growing portfolio of previously producing properties that include the Jersey-Emerald mine, which at one point was the 2nd largest historic zinc-lead mine in B.C. and the 2nd largest tungsten mine in North America. This press release may contain forward looking statements including those describing Margaux’s future plans and the expectations of management that a stated result or condition will occur. Any statement addressing future events or conditions necessarily involves inherent risk and uncertainty. Actual results can differ materially from those anticipated by management at the time of writing due to many factors, the majority of which are beyond the control of Margaux and its management. In particular, this news release contains forward-looking statements pertaining, directly or indirectly, to the following: Margaux’s exploration plans and work commitments, the potential of mineral resources and potential for recovery thereof, as well as other market conditions, the Company’s reasonable commercial efforts regarding financing activities, the ability to close the Offering in the amount anticipated or at all. Readers are cautioned that the foregoing list of risk factors should not be construed as exhaustive. These statements speak only as of the date of this release or as of the date specified in the documents accompanying this release, as the case may be. The Company undertakes no obligation to publicly update or revise any forward-looking statements except as expressly required by applicable securities laws. Margaux Resources Ltd. (TSXV: MRL) (OTCQB: MARFF) (“Margaux” or the “Company”) is pleased to announce that it has acquired additional claims to expand the Company’s Kootenay Arc project holdings in southeastern British Columbia. In addition, the Company has received high-grade gold grab sample results from the Sheep Creek and Bayonne properties. The new acquisitions include 13 mineral claims, totalling 1,670 hectares (an 8% increase in Margaux’s mineral claims holdings), which were attained from a third party for staking costs. The claims are contiguous to the Company’s Sheep Creek, Ore Hill and Jersey properties, as shown on the below map. Margaux Resources’ Kootenay Arc project now includes over 24,500 hectares of mineral tenure. Additionally, Margaux has received rock sample results from its fall 2017 work program, as listed in the table below. At Sheep Creek, sampling confirmed high grade gold values from the Motherlode and Bluestone veins, including grab sample values of up to 15.5 g/t Au. And at Bayonne, the sampling returned values of up to 13.0 g/t Au, which represents a newly discovered vein, located 150 m east of the eastern-most point on the Bayonne Main vein. Finally, Margaux is excited to announce that the fall 2017 work program is in its last phase of drilling. The Company is currently drilling at its Sheep Creek gold property, with results expected early in 2018. Results reported in this release are grab sample results collected from surface outcrops or from the dumps of historic workings. Grab samples are intended to show the presence or absence of mineralization and are not expected to be representative of average grade. Samples were shipped to ActLabs’ Kamloops, B.C. laboratory for preparation and analysis. Actlabs is an independent laboratory, recognized with expertise in analytical geochemistry and certified with ISO 9001:2008, ISO 17025, CAN-P-1579 certification. At the lab, samples were crushed so that 80% passes through a 10 mesh (2 mm) screen, then a 250 g split of the crushed sample was pulverized to 95% passing 105 microns. All samples were analysed for gold by FA/AA finish on a 30 g sample of pulverized material, and for a multi-element suite by ICP-MS following aqua regia digestion of a 0.5 g sample. For samples returning > 5 g/t Au by FA/AA methods, gold was assayed by FA/gravimetric methods on a 30 g sample. Industry best-practise QA/QC procedures were implemented during the sampling program, including the insertion of analytical blanks and standards at regular intervals. This press release may contain forward looking statements including those describing Margaux’s future plans and the expectations of management that a stated result or condition will occur. Any statement addressing future events or conditions necessarily involves inherent risk and uncertainty. Actual results can differ materially from those anticipated by management at the time of writing due to many factors, the majority of which are beyond the control of Margaux and its management. In particular, this news release contains forward-looking statements pertaining, directly or indirectly, to the following: Margaux’s exploration plans and work commitments, the potential of mineral resources and potential for recovery thereof, as well as other market conditions and economic factors, business and operations strategies. Readers are cautioned that the foregoing list of risk factors should not be construed as exhaustive. These statements speak only as of the date of this release or as of the date specified in the documents accompanying this release, as the case may be. The Company undertakes no obligation to publicly update or revise any forward-looking statements except as expressly required by applicable securities laws. 1,134,943 common shares (“Common Shares”) of the Company issued on a “CEE flow-through” basis pursuant to the Income Tax Act (Canada) (“Flow-Through Shares”) at a price of $0.36 per Flow-Through Share, for aggregate gross proceeds of $1.7 million (the “Offering”). Each Unit consists of one Common Share and one-half of one Common Share purchase warrant (each whole warrant a “Warrant”). Each Warrant will entitle the holder to acquire one Common Share (each a “Warrant Share”) at an exercise price of $0.40 per Warrant Share until 4:30 pm (Calgary time) on that date that is 24 months from the issuance closing date, (the “Expiry Time”) subject to accelerated expiry, if the 20-day volume weighted average price of the Common Shares on the TSX Venture Exchange exceeds $0.50 per share. Gross proceeds raised under the first tranche of the Offering are $1,728,580. 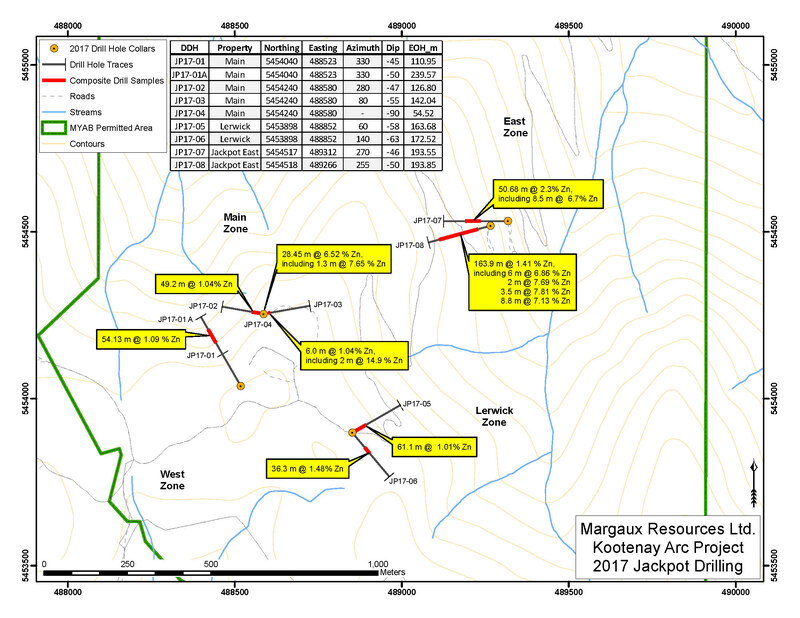 Margaux Resources Ltd. (TSXV: MRL) (OTCQB: MARFF) (“Margaux” or the “Company”) is pleased to announce it has received all the drill results from Company’s 2017 drill program on the Jackpot zinc property, part of the Company’s Kootenay Arc project in southern B.C. “These strong zinc results give us a great indication of the enticing mineralization in the area. Our work over the winter, and subsequent drilling in 2018, will provide a greater understanding of the extent and strength of these zones. We look forward to seeing how far reaching the mineralization is, especially considering the 2017 drilling only covered a small portion of the property,” said Linda Caron, Margaux’s VP Exploration. Nine holes, totalling 1,397 m, were drilled within a 500 x 1,000 m area, to test the Jackpot Main, Lerwick and Jackpot East zones. Results have been previously released for the first four holes from the 2017 program (see Company news releases October 25, 2017 and November 8, 2017). The results for the remaining five holes are included in this release (as highlighted below and on the attached map). Results reported in this release are composite, weighted average grades returned from continuous drill core samples across the interval. All intervals returning >1.5 m grading >6% Zn or >25 m grading >1% Zn are reported. Results for Pb and Ag are included for these intervals if values exceed 0.1% or 1 g/t, respectively. Intervals reported are core intervals. Further drilling is required to understand the relationship between core interval and true width. After logging, intervals marked for sampling were sawn along the core length, with half of the core placed in bags for analysis and the remaining half core piece returned to the box for reference. Samples were shipped to ActLabs’ Kamloops, B.C. laboratory for preparation and analysis. Actlabs is an independent laboratory, recognized with expertise in analytical geochemistry and certified with ISO 9001:2008, ISO 17025, CAN-P-1579 certification. At the lab, samples were crushed so that 80% passes through a 10 mesh (2 mm) screen, then a 250 g split of the crushed sample was pulverized to 95% passing 105 microns. All samples were analyzed for gold by FA/AA finish on a 30 g sample of pulverized material, and for a multi-element suite by ICP-MS following aqua regia digestion of a 0.5 g sample. For samples returning >5000 ppm Zn or >5000 ppm Pb, samples were subsequently analyzed using peroxide fusion/ICP-MS techniques. Industry best-practice QA/QC procedures were implemented during the drilling program, including the insertion of analytical blanks and standards at regular intervals, as well as systematic duplicate sampling. Core size was NQ2 (50.6 mm = 2-inch core diameter). Margaux Resources Ltd. (TSXV: MRL) (OTCQB: MARFF) (“Margaux” or the “Company”) is pleased to announce it has received final results from its fall 2017 diamond drill program on the Bayonne gold property, part of the Company’s larger Kootenay Arc project in southern B.C. 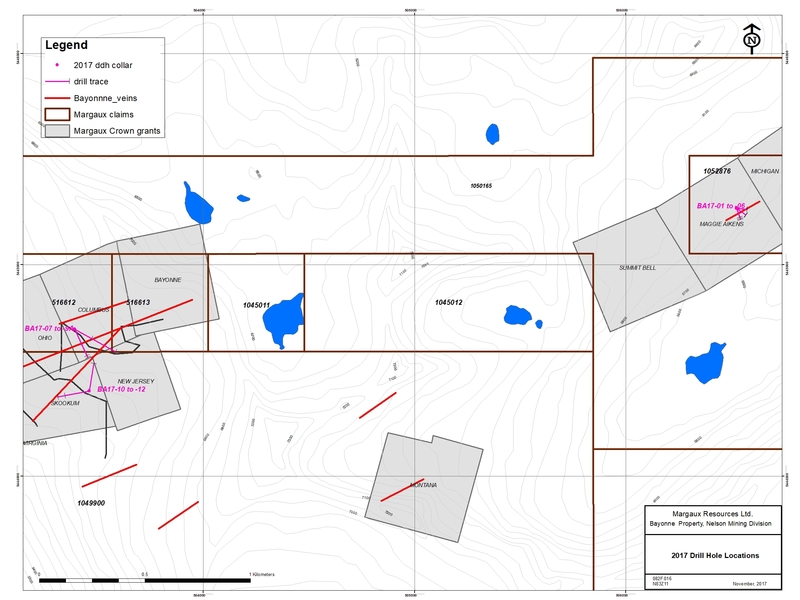 “Results from our 2017 drilling program and surface exploration continues to prove to us that while there was historic production at Bayonne, the property still has much more to discover and offer, as indicated by our identification of previously underexplored vein systems, significant strike extensions and high-grade gold intercepts, all of which continue to build on the success of our consolidated Kootenay Arc gold-zinc package,” commented Linda Caron, Margaux’s VP of Exploration. The Bayonne property hosts several high-grade, steeply dipping gold-bearing orogenic quartz veins hosted by granodiorite. Thirteen holes totaling 2,089 m were drilled on the Bayonne property during 2017, to test 3 separate vein targets. Results have been previously released for 10 holes from the 2017 program (see Company news release October 24, 2017 for further detail), results for the remaining 3 holes are included in the table and map below. With the exception of hole BA17-09, which was lost before reaching the target depth, all of the 2017 drill holes successfully intersected the vein structure that was targeted by drilling. Elevated gold values (greater than 100 ppb gold) were intersected in vein structures in all drill holes, with values exceeding 1 g/t gold listed in the table below. Results reported in this release are composite, weighted average grades returned from continuous drill core samples across the interval. Intervals reported are core intervals. Further drilling is required to understand the relationship between core interval and true width. After logging, intervals marked for sampling were sawn along the core length, with half of the core placed in bags for analysis and the remaining half core piece returned to the box for reference. Samples were shipped to ActLabs’ Kamloops, B.C. laboratory for preparation and analysis. Actlabs is an independent laboratory, recognized with expertise in analytical geochemistry and certified with ISO 9001:2008, ISO 17025, CAN-P-1579 certification. At the lab, samples were crushed so that 80% passes through a 10 mesh (2 mm) screen, then a 250 g split of the crushed sample was pulverized to 95% passing 105 microns. All samples were analysed for gold by FA/AA finish on a 30 g sample of pulverized material, and for a multi-element suite by ICP-MS following aqua regia digestion of a 0.5 g sample. For samples returning > 5 g/t Au by FA/AA methods, gold was assayed by FA/gravimetric methods on a 30 g sample. For samples returning >5,000 ppm Zn or >5,000 ppm Pb, samples were subsequently analyzed using peroxide fusion/ICP-MS techniques. Industry best-practice QA/QC procedures were implemented during the drilling program, including the insertion of analytical blanks and standards at regular intervals, as well as systematic duplicate sampling. Core size was NQ2 (50.6 mm = 2-inch core diameter). If you look at a map of historical mining districts in British Columbia, the southeastern corner stands out. Gold, silver, lead, zinc and tungsten have all been profitably mined in the area. For Margaux Resources (V.MRL) looking at past mines and the geological structures which underlie them suggested a broad, district scale opportunity. Lead, zinc, tungsten and gold are all contained within a geological structure referred to as the Kootenay Arc. Linda Caron, Margaux’s VP Exploration has a deep explanation of the Arc and how it came to be formed in a presentation she gave to MEG in Calgary in May 2017. (If you are interested in geology and how it pertains to mineral deposits this is a straightforward introduction.) The Arc itself was formed when the North American continent pushed out into a primordial seabed. It is essentially an ancient coastline that has been crushed. That arc of disturbed rock has been host to a number of hugely productive mines. The Jersey Emerald lead zinc mine operated continuously from the 1920’s to 1973 and at one time was the 3rd largest zinc-lead producer in British Columbia, as well as the second largest tungsten producer in North America. The nearby Sheep Creek property has historic gold production totalling 630,000 ounces, from 26 historic gold vein mines and is analogous to the Barkerville District of central British Columbia. Margaux’s key insight was that these historic mines were all part of a district scale system and that this system could and should be consolidated. This was not just theoretical for Rice. An accountant by training, Rice owns 1.8 million Margaux shares. Which is a commitment. But the bigger commitment is that Rice moved his family into the area. There has never been any mining in the Jackpot zone. Margaux’s plan is to delineate the lead/zinc using historical records of the known deposit at Jackpot East and then identify drilling targets. But the company also recognizes that there is a significant gold potential at Jackpot as well as its other land. The classic brownfield exposure at the Jersey Emerald mine gives Margaux tremendous lead and zinc potential. “We have the historical core and records for Jersey Emerald,” said Rice. Margaux also has a 43-101 lead-zinc resource estimate for the Jersey property and has been working to expand that resource. In 2016/17 it drilled in the area and completed an extensive program of surface and underground surveying, data entry and QA/QC work to verify historical drill and underground information, in preparation for an updated resource estimate. In 2017, Margaux had a 43-101 compliant technical report prepared on the Sheep Creek project which included historical data from several past producing orogenic gold vein mines in the area. As well, in its press release of October 4, 2017 the company disclosed that it had 48 soil samples taken within anomaly zone “results include a maximum of 13.5 g/t gold and an average of 2.95 g/t gold”. Another element of brownfield leverage are the “left overs” from previous mining. On the gold side, miners treated rock grading less than a quarter ounce per ton as waste rock. With modern recovery techniques ¼ ounce, or 7 grams per ton, gold bearing rock is now seen as mid-grade gold rock. Overall Rice sketched an ambitious agenda for Margaux. “We’ll be completing our full 2017 drill program and we hope to understand our gold properties. Then we’ll be drilling in the spring with a primary focus on the gold deposits. The lead and zinc are secondary,” said Rice. “We have a strong team and we’re not dependent on a major stepping in,” said Rice. However, Rice points out that Steve Letwin, CEO of IAMGOLD, is on the Margaux Advisory committee. With so many highly prospective targets, Margaux can move ahead on many fronts. The endowment of Kootenay Arc invites a methodical, well planned, exploration campaign designed to bring past producing mines and underexplored deposits back to life in the 21st century.